Sherwin Williams produced this 36″ by 48″ yellow sign. 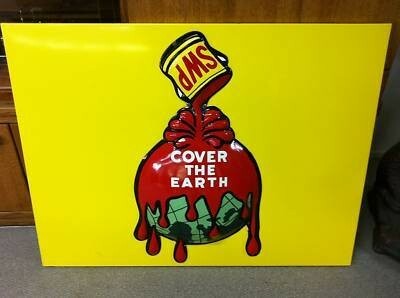 The sign is done in their standard style with the “Cover the Earth” phrase written over the globe covered in paint. This is a standard design. The paint can pouring paint on the Earth has “SWP” written on it to signify Sherwin Williams Paint.